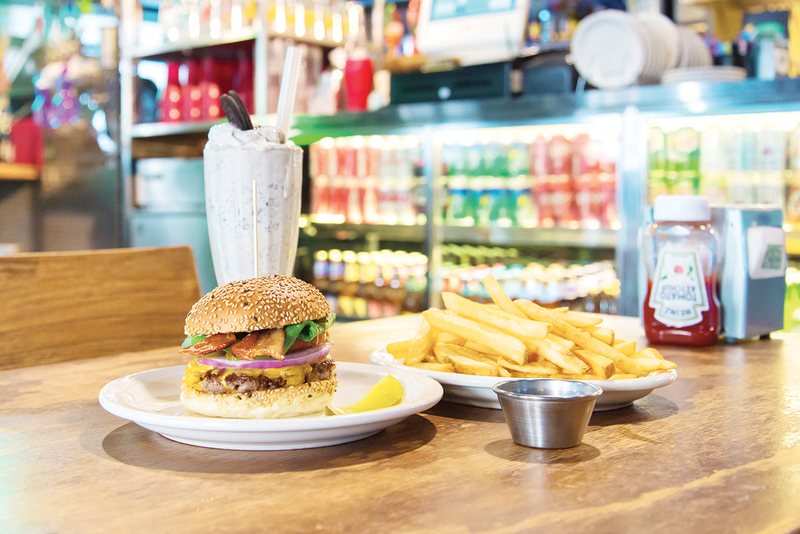 The city’s full of delicious burger joints, each with their distinctive styles. Pair them with a calorie-laden milkshake or a cool pint of ale, the choice is yours. Notice the name. It’s not a burger in Itaewon. It’s the burger in Itaewon. It’s all about making the best burger in town. To do that, the shop makes its patties every morning from choice-grade US beef. The patties are grilled over charcoal made from coconut palm shells. This lends a subtle charcoal flavor to the juicy patties. 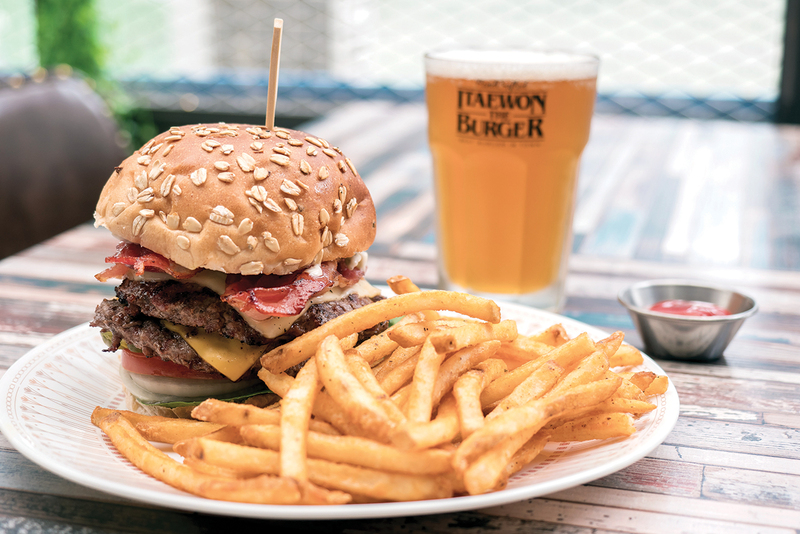 The burgers are made with whole meal buns baked daily from the acclaimed bakeshop, The Velo, famous for its long-fermented breads made with only natural starters. To top it off, the burgers are served with house-made sauces, using various herbs and spices to enhance the flavors of the patties and toppings. The difficulty is in choosing which of the burgers to try at a sitting. Popular choices include the Big Double Burger or the BBQ Bacon Cheese Burger. Feeling a little adventurous? The Cherry Cream Cheese Burger might be the answer. In line with current burger trends, the shop is pushing its burgers with avocado like the Avocadict Burger and the Lettuce Avocado Burger. There’s also a good menu of sides like cajun fries and buffalo wings. 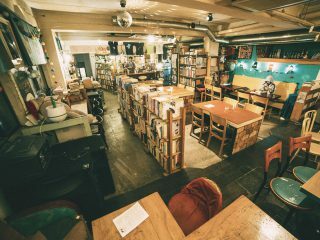 And don’t forget the shakes and craft beers. Firebell is a small but stylish burger joint tucked away in the hagwon alleyways of Daechi-dong. 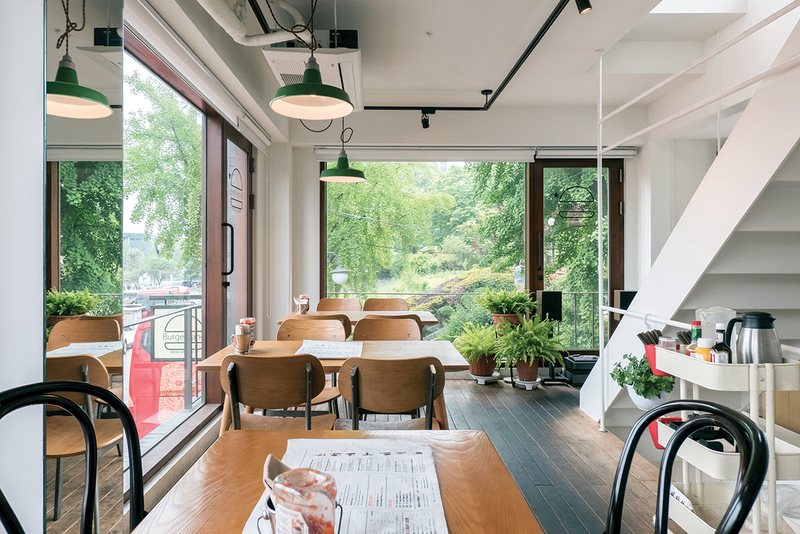 Locals say that the red and white interior with its fire-station motif helps to get your appetite going, and so do the smells from the grills in the open kitchen. 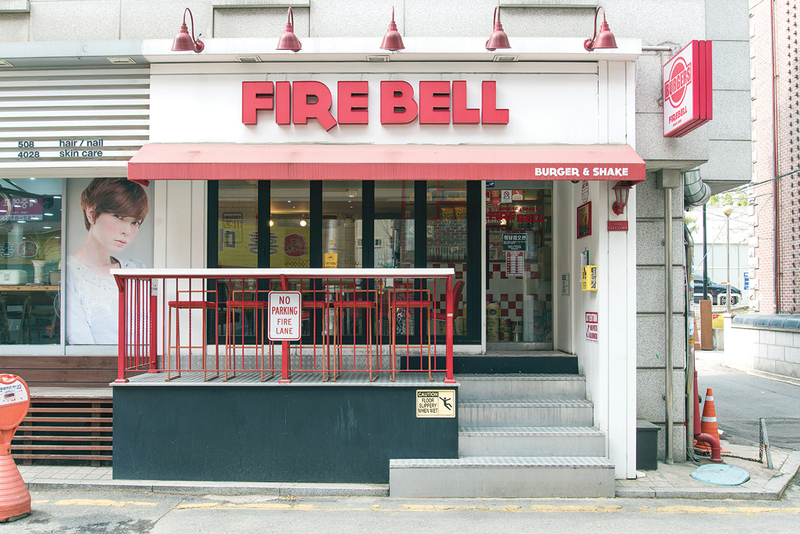 Firebell burgers never fail to satisfy your burger cravings. It’s famous for their spicy burgers like the Call 911 and Havana. Koreans believe the spiciness balances out the richness of the meat patty and cheese. But Firebell is also known for its simple classic burgers: the Rookie, a classic cheeseburger, and Dr. Leo, stacked up with bacon and cheese. These burgers highlight the quality of the patties, toppings and buns. If you’re in the mood for something different, try the new Beverly Hills burger, with bacon chips, grilled mushrooms, swiss cheese and truffle mayo. Pair whatever burger with a side of the perfectly-done fries. And if you’re not counting calories, order the Nutella milkshake to round out the perfect burger set. There’s attention to detail at Burger Bang. 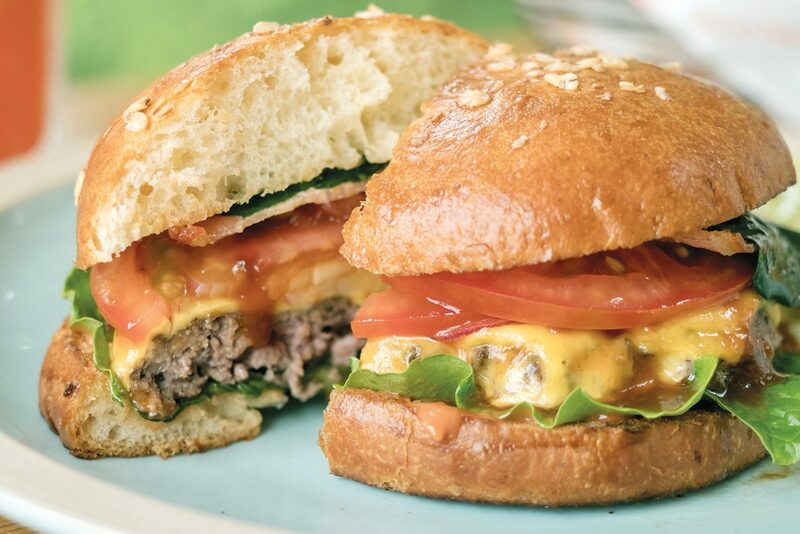 The Bukchon burger joint bakes its brioche buns each morning using high quality Italian flour, Caputo. The meat patties are made from beef finely minced twice daily and are not seasoned too much in order to bring out their flavors. Their signature The Burger Bang is made with cheddar cheese, onion, bacon, tomato and spinach. If you’re in the mood for something more spicy, try the American Chili Burger. The delicious balsamic dressing is made in-house and so are the sparkling fruit ades, including the popular grapefruit ade. The cherry on top is the location of the restaurant. 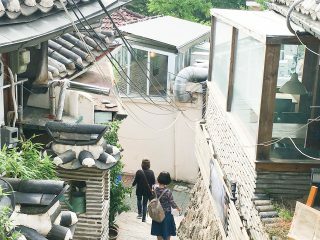 A lovely view of the Changdeokgung Palace area is the perfect accompaniment to the food and drinks. And as the owner is the owner of an rchitectural firm, there’s great care put into the interior and design elements. In many ways, Burger Bang is a surprise, a surprises to the senses. Make sure to go during late afternoon and enjoy a sundowner with your burger. 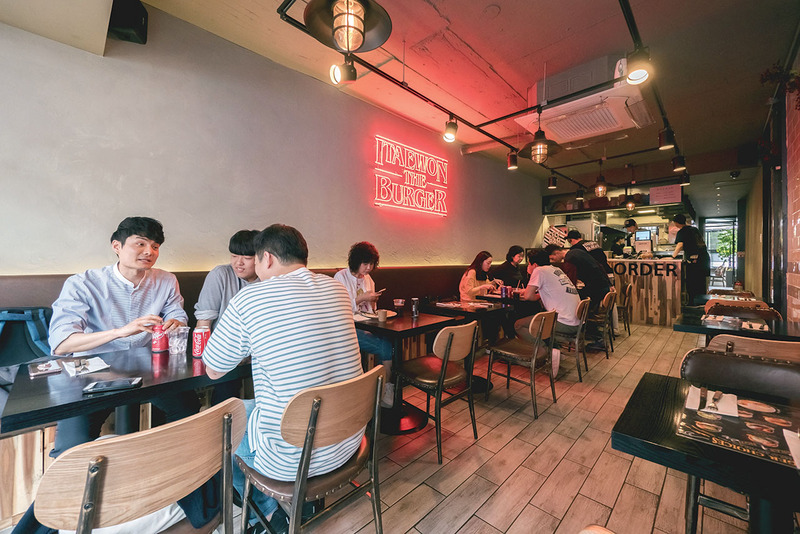 The restaurant’s green neon signs point customers into its half-basement location in Garosugil. Many cafés and dessert shops have come and gone in the area, but Gilbert’s Burger has proven its mettle. 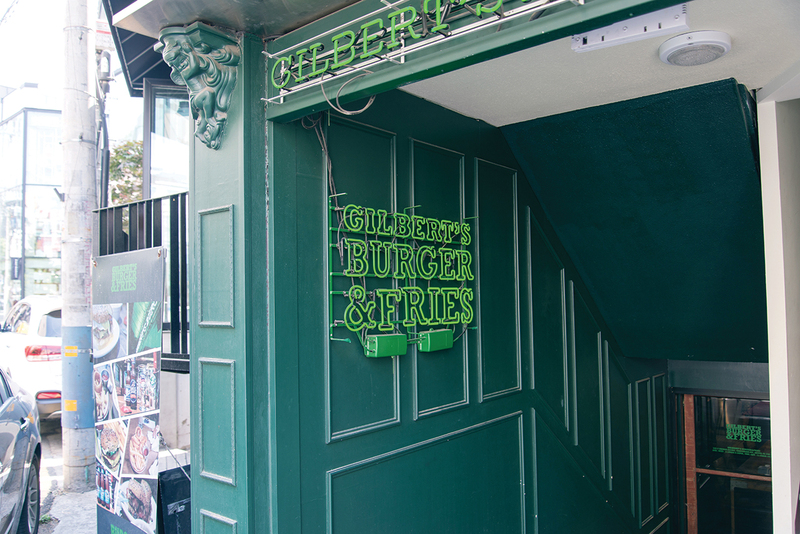 Customers love the hip and laid-back atmosphere, but Gilbert’s popularity rests on the consistent quality of the burgers they serve. 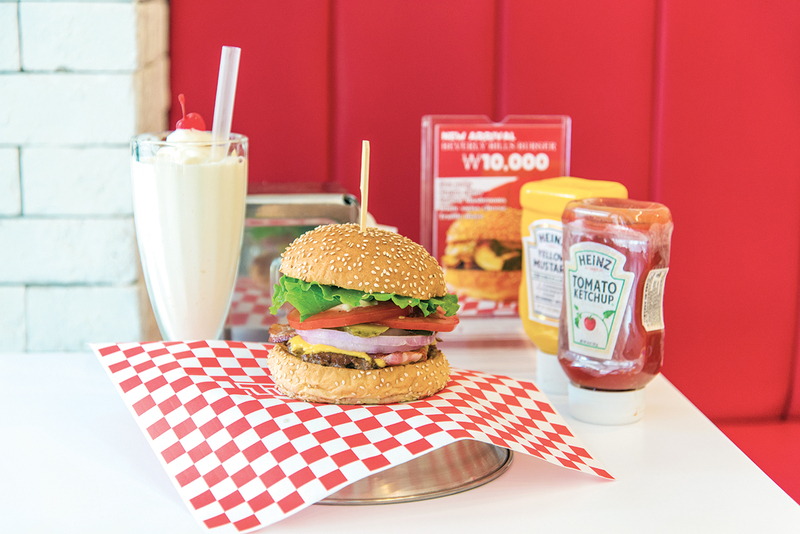 They know how to grill up a mean American-style burger with its juicy patty and fresh toppings. The meat patties are made daily from freshly ground beef. The kitchen uses a mix of different beef cuts to make the patties juicy and firm. The popular Mr. President burger is topped with cheddar cheese, bacon, romaine lettuce, tomato, onions and a dill pickle. Folks love the sides as well. Some say the sweet potato fries are the best in town. But for others, the onion rings are hard to beat. And of course there’s a delectable array of diet-busting milkshakes, beers and sodas available. A tip for folks looking to lower their calorie count: there’s a junior version of the Gilbert burger.